Everyone wants to stay warm during the cold winter month. Most people like to do it the old-fashioned way using conventional fireplaces. But that means lots of smoke and mess to deal with. You wouldn’t want that for your well-decorated room, would you? The best way to stay warm without creating a mess or breaking a sweat is by using electric fireplace heaters. These heaters provide the old-world charm of a fireplace and create a cozy look without additional heating. Electric fireplace heaters come in different types ranging from fireplace inserts, wall-hanging units to all-in-one units. Heating is done using a forced fan heater or infrared heater, with the latter proving more ideal for larger spaces. 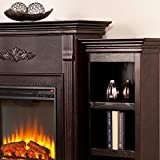 In order to choose the right electric fireplace heater, you’ll need to consider the size of your space, heater style, flame effects, and other features that count. Take a moment to explore our recommendation of the best electric fireplace heaters and maybe you might just realize you need one. This electric fireplace heater comes in a freestanding design that can be moved from one room to another. The 4,600 BTU heater provides supplemental heating for areas up to 400 square feet. This makes it ideal for heating small rooms. The heater delivers a realistic flame effect and sports glowing log and amber bed. It has a flexible option that lets it be operated with or without heat. That means you can enjoy the ambiance of that gentle rolling fire all year round. Mechanical controls are included to match your desired level of heating and you get an overheat protection feature for maximum safety. Direct heat exactly where it’s needed with this quartz fireplace. It provides a powerful supplement heat that’s ideal for large rooms up to 1,000 square feet. The fireplace makes use of a quartz infrared heating technology to create a soft and moist heat without compromising its cool-to-touch surface. It has provides a dramatic 3D flame effect and has adjustable brightness set to 5 different levels. The fireplace sports glowing log and amber bed for a more realistic flame effect. Heat large and with ease using Jackson bronze infrared electric fireplace heater. This electric heater comes with a remote control that lets you adjust the flame and heat without leaving your chair. The infrared heating mechanism provides supplemental heating for areas up to 1,000 square feet. There’s a digital thermostat that comes in handy to maintain a target room temperature. This fireplace also has manual controls as a plus. It comes portable enough to be moved from one room to another. 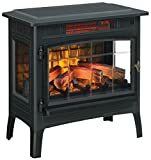 This is a moveable lightweight heater that comes in a unique stove design. With it, you get supplemental heating for small rooms up to 400 square feet. It has realistic flames that provide the calming effect of fire and you can choose to combine it with some heat. Flame height and temperature are adjustable to match your taste. The fan is barely audible and spreads the heat evenly throughout your room. The control panel is hidden behind a functional door and there’s a remote control that lets you adjust the settings from a safe distance. 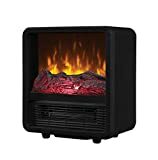 This portable electric fireplace heater gives you the luxury of moving from one place to another. It’s designed to heat small living spaces measuring up to 400 square feet. This little gem of a heater provides that pleasing effect of an ambient fire light that brightens your mood in cold and dark days. There’s a low heat and high heat setting of 750 watts and 1,500 watts respectively. The heater stays cool to touch and shuts off instantly in case of any overheating. It’s a great choice for those that have limited space. 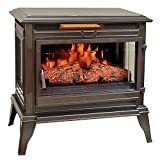 Add some classic look to your room with this electric stove heater. The heater comes in a freestanding style with a vintage elegance to it. A meshed 3-sided open design provides a full view of the dancing flames and realistic logs. There are two heat settings to adjust to your comfort level. 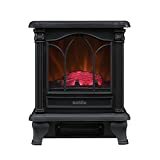 This electric fireplace heater has manual controls that let you adjust temperature and flame brightness with ease. The half cylindrical design makes it fit in all indoor spaces including corners. This electric heater comes in a cream color that literally lights up your room while adding some warmth to it. The heater is not all about elegant styling, but it also sports a portable size that gives you an easy time when relocating from one room to another. It creates a replica of a real flame with glowing logs in it. Heating is done using infrared technology, a feature that provides supplemental heating in areas up to 1,000 square feet. You get to adjust the temperature, brightness or switch the heater on and off using a remote control or the included manual controls. This fireplace stove heats up without creating the effect of dry air. It makes use of infrared heat to maintain natural humidity while providing the warmth you need. 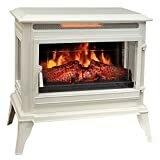 This electric fireplace heater is rated at 5,200 BTU providing supplemental heating in rooms up to 1,000 square feet. A realistic flame with glowing logs and amber bed create the look and feel of a traditional fireplace. The fireplace stays cool and it’s quite easy to put together. 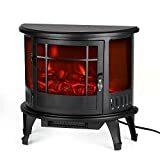 In case you don’t want a flashy color for your infrared heater, this electric fireplace heater might just be the thing you’re after. It comes in a black color that complements the decor of any room. The heater warms areas up to 1,000 square feet. And you don’t have to get up from your seat to adjust the flame brightness or temperature. These can all be done in the comfort of your seat using a remote control. The temperature is set at a target level using a digital thermostat. This electric fireplace heater is portable enough to be used in any room you want. This is a traditional mantel sporting 6 storage shelves and a placement for a flat TV measuring up to 68.25 inches. This makes it a great all-in-one unit for an electric fireplace heater. The heater warms areas up to 400 square feet and has an adjustable temperature range of 62 to 82 degrees. A self-regulating mechanism turns off the heater when the target temperature is reached. You get a realistic flame effect provided by long life bulbs. A remote control is included so you can operate it from anywhere in the room.